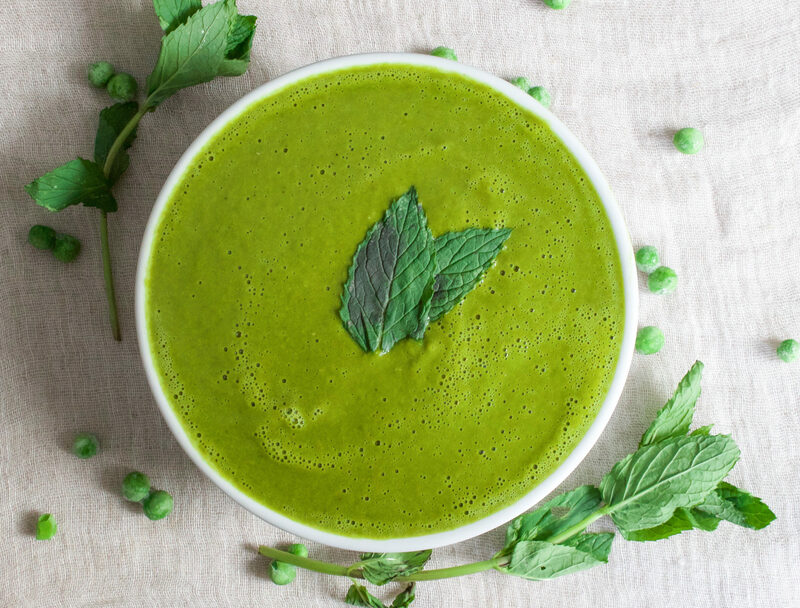 This kale, broccoli and minted pea soup is insanely detoxifying and loaded with good-for-you ingredients. We know how great those green veggies are, plus I have added ginger, lemon, onion, cayenne, garlic, and turmeric for added anti-inflammatory, metabolism boosting, antioxidant and cancer prevention benefits. I love making this soup after a weekend of too much eating (and maybe drinking) to make sure I’m counter balancing with those extra green veggies! 1.In a big stock pot, heat olive oil over medium heat.Add chopped onion and a pinch of salt and cook until soft, about 5 minutes. Then, stir fresh ginger, turmeric and garlic. Cook for 30 seconds. 2. To the pot add your broccoli, kale, peas, and stock. Bring to a boil then reduce heat to simmer for 4-5 minutes or until broccoli is cooked through. Once it is cooked add your spinach and mint. 3. Using a stick blender or high power blender (like Vitamix) carefully blend soup until smooth. I like to add a good amount of veggies into a blender with 2 ladles of stock. You might need to do this in several batches. 4. Season soup with salt and pepper and more lemon juice if desired. Serve with tasty extra virgin olive oil and your favourite sprouted chip or crunchy chickpeas! Store in an airtight container in the refrigerator for up to 5 days. This looks so goo and so healthy, can’t wait to try. Would be really good for people suffering from gut conditions or inflammation of any type, due to the tumeric and ginger content . Think it would make a nice summer soup, but I’m not waiting til then – putting this on my list of what to try this week – thanks!